Fluorescent nanoparticles, especially fluorides, have received a great deal of interest due to their optical properties, making them suitable for applications in bio-imaging. For this reason they need to exhibit a superior chemical stability in aqueous media. We have studied the influence of the synthesis parameters on the chemical stability of NaYF4 nanoparticles co-doped with Yb3+ and Tm3+. 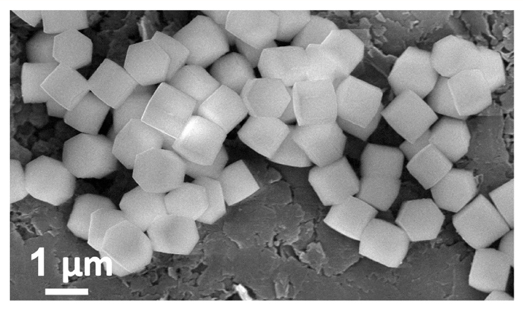 These nanoparticles have different crystal structures, and were synthesized hydrothermally or with thermal decomposition. The samples were characterized with X-ray diffraction and transmission electron microscopy. The up-conversion fluorescence of nanoparticles dispersed in water was measured at 400–900 nm. The partial dissolution of the fluorine in water was detected with an ion-selective electrode for all the samples. The dissolution of the other constituent ions was analysed with an optical emission spectrometer using inductively coupled plasma. The nanoparticles with a hexagonal crystal structure and sizes of around 20 nm that were synthesized with thermal decomposition showed a superior chemical stability in water together with a superior up-conversion fluorescence yield.